"Don't worry, we saved you a spot!" This adorable bed-hogging pack (pictured from left to right) is made up of Mitchy and his two canine siblings, Candy and Hemi. Candy and Hemi were both adopted from Young at Heart and are enjoying their golden years being loved and spoiled by their family. 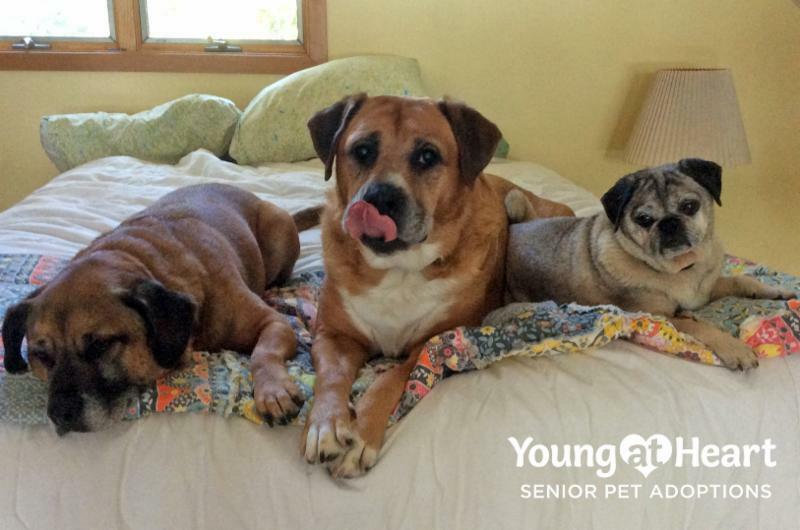 Thank you for giving senior pets like Candy & Hemi the chance to enjoy their golden years as part of a loving family! and the YOUNG AT HEART logo are registered trademarks of Young at Heart. © Copyright 2019 Young at Heart Pet Rescue. All Rights Reserved. Save the life of a senior pet. Become a Constant Companion monthly donor. Become a Constant Companion Now!